Origin and Habitat: Paraguay, southern Bolivia, Brazil and northern Argentina. Habitat and Ecology: Rhipsalis baccifera subs. shaferi is an epiphytic or saxicolous cactus, usualty growing on trunk or branches of large trees, hanging in large clusters in a wide variety of habitats comprising low and medium elevation forests, rain forest, riverine forests and mangrove tidal swamp. It also grows in humus on shady rocks. It is usually abundant where it occurs. The fruits attract birds, that spread the seeds, so the species can reproduce easy and fast, taking over trees in a large area. It is likely to be affected by a number of minor threats. However, none of these threats is significant enough to warrant any concern. Description: Rhipsalis baccifera subs. shaferi is a tropical evergreen but leafless, succulent, epiphytic plant with thin hanging stems. Although a member of the cactus family, it has a very different appearence and is spineless. Subspecies schaferi distingushes for its generally shorter, stiffer stem-segments than subsp. baccifera, with which it intergrades. Subspecies schaferi, should be treated as a good species ( Korotkova 2011). It is commonly known as the mistletoe cactus. Derivation of specific name: shaferi For John A. Shafer (1863–1918), USAmerican botanist, pharmacist and plant collector, esp. in the West Indies, collected 1916–1917 cacti for the US-American botanists N. L. Britton and J. N. Rose in South America. Flowers: Numerous, white or greenish-white, patent, scattered all along side of branch, solitary (rarely in pairs) at areoles, small, rotate, 8 to 10 mm broad; petals 5 or 6, short-oblong, obtuse; filaments greenish, erect; stigma-lobes 4, white; ovary not sunken in branch. Pericarpel not immersed in the areole. Fruits: Small, globose, 2 to 3 mm in diameter, white or sometimes tinged with pink. 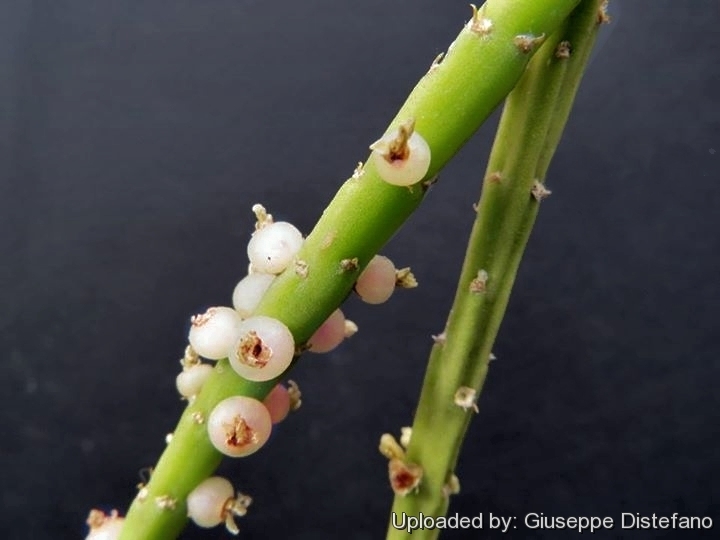 Rhipsalis baccifera (J.S.Muell.) Stearn: (subsp. baccifera) is mostly an epiphyte but at times a lithophyte, both diploid and tetraploid. Distribution: Caribbean, eastern Mexico, Florida, Central America, and northern South America. Rhipsalis baccifera subs. erythrocarpa (K.Schum.) Barthlott: is a tetraploid form. Distribution: it is found only in the mountains of east Africa. Rhipsalis baccifera subs. hileiabaiana N.P.Taylor & Barthlott: is very densely branched. Distribution: Bahia, Brazil. tetraploid and octoploid populations. Distribution: Madagascar. Rhipsalis baccifera subs. mauritiana (DC.) Barthlott: is a tetraploid form. Distribution: Old World, from tropical Africa east to Sri Lanka. Rhipsalis baccifera subs. shaferi (Britton & Rose) Barthlott & N.P.Taylor: has shorter,stiffer stem segments than subspecies baccifera . Distribution: Paraguay, southern Bolivia, and northern Argentina. 4) Rhipsalis “Rhipsalis shaferi Britton & Rose” <http://rhipsalis.com/species/baccifera_shaferi.htm> Downloaded on 09 December 2015. 8) Arreola, H., Hammel, B., Hilton-Taylor, C., Ishiki, M., Loaiza, C., Nassar, J., Oakley, L., Pin, A., Taylor, N.P., Terrazas, T. & Zappi, D. 2013. Rhipsalis baccifera. The IUCN Red List of Threatened Species 2013: e.T62378A3114245. http://dx.doi.org/10.2305/IUCN.UK.2013-1.RLTS.T62378A3114245.en. Downloaded on 10 December 2015. Cultivation and Propagation: Rhipsalis baccifera subs. shaferi is among the easiest to cultivate epiphytic cacti and tolerates neglect. These forest cacti tend to be long lived. Exposure: This plant (as with all Rhipsalis) prefers partial shade. Watering: It requires ample summer water (more than other cacti), but allow soil to dry slightly between waterings. Soil: These cacti won't want a normal cactus soil but will prefer to be in a soil largely composed of organic material, such as peat or sphagnum moss, This type of soil would normally be used for orchids, bromeliads or other epiphytic plants. These forest cacti tend to be long lived. Hardiness: Frost tender. It needs night-time temperatures no cooler than 5° C, especially in the winter.